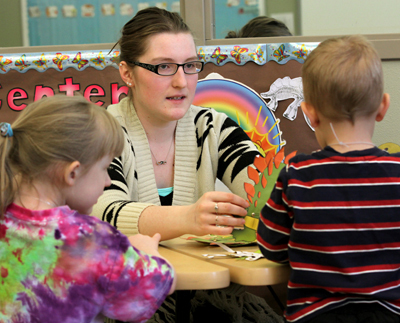 Minot State University's Early Childhood Education major blends theory with practical application. Students learn a holistic approach to child development - birth to age 8 - and apply what they learn in the MSU Preschool Center. Core classes (selected): Infant/toddler development, early childhood education, foundations of reading, math and the young child, arts integration, observation and assessment, leadership and supervision. Professional education sequence: Early childhood education teaching methods and activities, technology in teaching, managing the learning environment, teaching diverse learners. Early childhood education majors are required to complete student teaching. As a student teacher you will be responsible, as much as is appropriate, for the cooperating teacher’s classroom. Our College of Education and Health Sciences is internationally known for producing quality professionals and pre-professionals in education, human service and health science. The increased value placed on early childhood education and the growing population of children ages 3 to 5, means employment of early childhood educators is growing faster than average. Those with bachelor’s degrees have the best job prospects. Early childhood educators typically work with children from birth through grade three. They explain reading, writing, science and other subjects in ways young children can understand. They work in public and private schools, childcare centers, and charitable organizations. The College of Education and Health Sciences is internationally known for producing quality professionals and pre-professionals in education, human service and health sciences. Our programs are accredited by the National Council for Accreditation for Teacher Education.